We love real Christmas trees. They smell great, they remind us of childhood, they are recyclable and green, they improve our indoor air quality, at least for a while. With friends already putting up their trees over the Thanksgiving weekend, though, we thought we would take a look around and see if real Christmas trees come with any environmental challenges we haven't thought about while we are choosing the perfect tree. According to The Straight Dope, "In a typical year perhaps one tree in 100,000 is bug-ridden. The critters are seldom harmful to humans. One grower’s guide notes that with adelgids, an insect found on white pine trees, you should 'educate your buyers that this is a mostly harmless pest that is found everywhere including yard trees.'" As usual, prevention is key. Inspect your tree for brown casings (praying mantis eggs) and white stuff that looks like snow--it's not. It is the above mentioned adelgids. Give your tree a vigorous shake outside before you bring it in (you probably did this at the Christmas tree lot to make sure too many needles didn't fall off before you bought it). Pick another tree if you see tiny holes in the trunk or branches that could indicate termites. 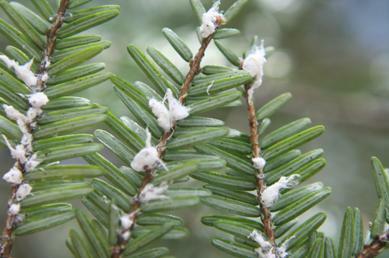 The American Christmas Tree Association says that if you have allergy symptoms during the holiday season, you may be suffering from "Christmas Tree Syndrome," a reaction to mold spores on your real tree. Their advice? Hose it down--Ask your tree vendor to spray the tree with water or do it yourself before you bring it in the house. Then leave it outside to dry. Keep it brief--Don't put your tree up early or leave it up late. Decorate the weekend before Christmas and redecorate for New Year's to minimize your exposure if you or someone in your family is sensitive to mold spores. We hope your holiday season is filled with comfort and joy, not pests and spores!